Freshly Painted! All the Bells and Whistles and a super location! 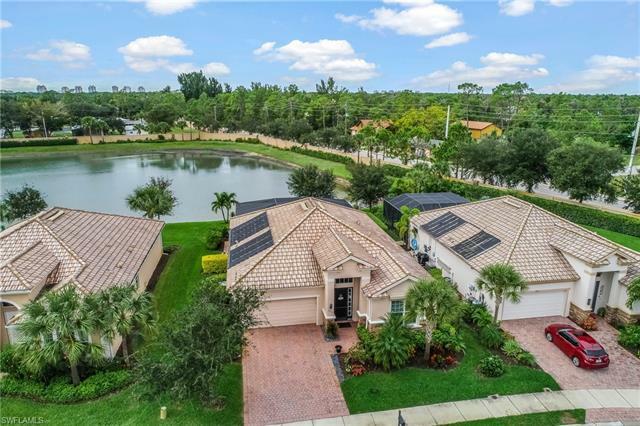 Open great room floor plan looks out to a beautiful lake view, an expansive lanai area featuring a large Solar heated, salt water pool and spa with remote control.The extended pavered lanai offers plenty of space for living and entertainment. Fine appointments include Upgraded Wood Cabinetry throughout the home, granite countertops, Tile flooring and upgraded appliances. Enjoy peace of mind with your NEWLY INSTALLED ELECTRIC STORM SHUTTERS. NEWER French Door Refrigerator, washer and dryer 2017. Hawthorne is "Special Jewel" conveniently located in in the Heart of Bonita Springs. The community is gated with 24 hour security and amenities which include two pools, two spas, two tennis courts, two fitness centers, a Clubhouse and Community Room. Enjoy walking, biking and running through the lake filled community, Socially active with monthly social events, card groups, men and women luncheons, community outings, book clubs, game nights and more. Hawthorne is conveniently located to Beaches, fine grocery shopping, restaurants, Coconut Point Mall, Miromar Outlet Mall, RSW Airport and both Naples and Fort Myers.